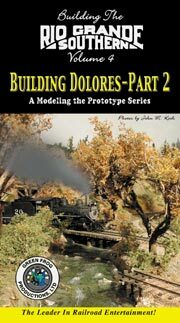 Volume 4 of Building The Rio Grande Southern covers the final portions of building the town of Dolores. and construct an additional part of the town that runs perpendicular to the Dolores River. and we'll build a canyon to separate our town from the New Mexico logging area. Then we'll also plant a stand of pine trees on a hill constructed near our canyon, and show you how we blended the live scenery at this end of town into our Dolores photo mural backdrop, and against the new sky backdrop where a distant hill was constructed. Last, we'll construct a retaining wall made of stone and logs to hold up a portion of our hill and our logging branch, plant some Aspen trees...and blend the real trees into the backdrop trees. We conclude this tape on Dolores with some prototypical running shots of what to expect in Volume 5 of building the RGS.